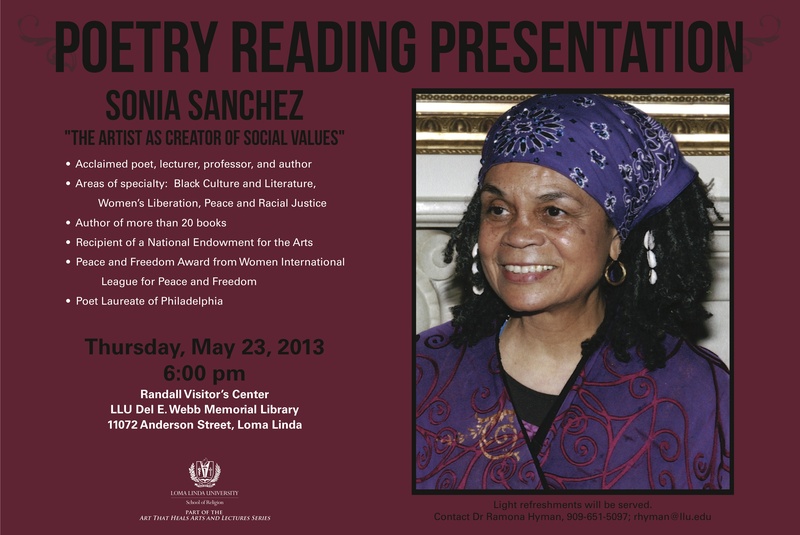 For southern Cali folks, you won’t want to miss this event tonight: Sonia Sanchez, award-winning poet and activist, will present “The Artist as Creator of Social Values,” part of the Loma Linda University School of Religion’s Art That Health Arts and Lectures series 6:00 p.m., Thursday, May 23, 2013. Founded by Dr. Ramona L. Hyman, the lecture series highlights the integration of all of the arts and healthcare. Ms. Sanchez has published over 20 books, most recently “Morning Haiku” (2010), and has received numerous awards for her work, including a National Endowment for the Arts grant, a PEW Fellowship in the Arts, and the Langston Hughes Poetry Award, as well as the Poetry Society of America’s Robert Frost Medal. She was appointed the first poet laureate of Philadelphia in 2011. In addition to her writing, Ms. Sanchez has lectured at universities and colleges around the world, retiring in 2012 as professor emeritus from Temple University where she held the Laura Carnell Chair in English. Sonia Sanchez’s presentation will be held in the Randall Amphitheater at 6 p.m. Light refreshments will be served. This entry was posted in Uncategorized and tagged Dr. Ramona L. Hyman, Loma Linda University, Sonia Sanchez.